Our fellow Supra-arrival-breath-holders over at Supramkv.com have posted an alleged leaked, internal BMW document that shows a huge list of BMW internal model codes, and some crucial specs. The document lists a huge number of BMW models, including the J29 platform ones that we’ll know as the Supra. Sadly, a manual transmission doesn’t seem to be on the list. This list has actually been available for a few months, so this information may change or have changed, but it’s still interesting to see what seems to be planned. Also, we have not in any way verified the authenticity of this file; it has some unusual things referenced, like a U.S.-market X3 xDrive/sDrive 30i with a stick shift, which doesn’t really seem to exist. And it references an X7, which isn’t available yet. So, really, I can’t say I know exactly what this document is. As you can see by all those AUTs, there does not seem to be a manual version of the Supra in the works. In this document, which you can see for yourself here, manual transmissions are denoted with the word MECH. Europe gets two 4 cylinder models (represented by “20i” and “30i”) and a 6 cylinder model (40i). U.S. gets one 4 cylinder model (248hp?) and a 6 cylinder model (335hp?). The four is likely the B48 generation engine, and the straight-six seems to be the BMW B58 engine, which normally makes 335 HP, though we don’t yet know if there will be tuning differences that would change this number. 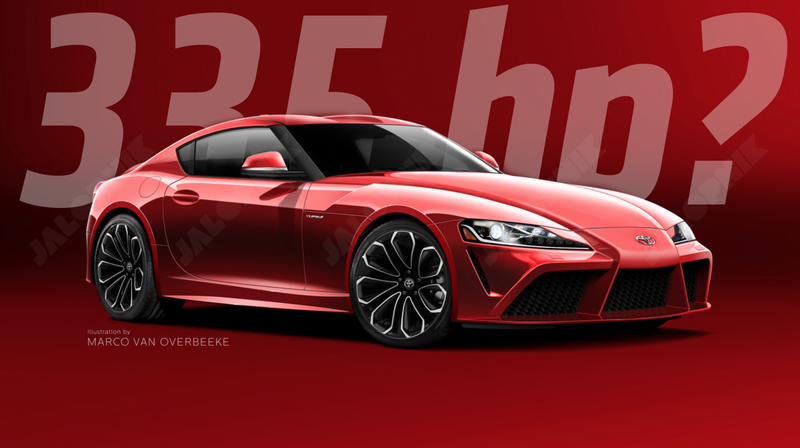 Personally, I suspect 335 HP might be just the right number to have fun in the new Supra, but there’s no doubt many fans will be disappointed if it comes out with that low a number. The lack of a manual is more disturbing, I think. ... to just list a few. It’s also notable that all variations are RWD, with no AWD variations to be seen, which seems right. Also, unlike some have guessed, it doesn’t seem like it’s going to be an AWD hybrid drivetrain, either. What the hell is that? A BMW model number for something both Toyota and FWD? I can’t think of any carmaker less likely to need help developing a FWD vehicle than Toyota. Is that a Mini platform? What’s going on here? There’s a bunch of other interesting models in the list, including references to Morgan (BMW supplies engines) and Brilliance (BMW has a joint Chinese venture with them). Peugeot is also listed, perhaps in reference to the PSA Prince engines BMW uses in some Minis? Whatever all this is, it’s some of the most interesting stuff you’ll see that was dumped out of some database.